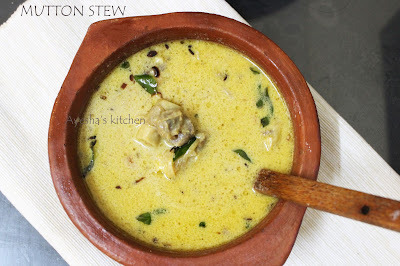 Kerala cuisine offers a wide variety of mutton recipes which are very popular among foodies around the world. Mutton stew come under this category . Mutton stew and appam is a very nice combo, which is my all time favorite. 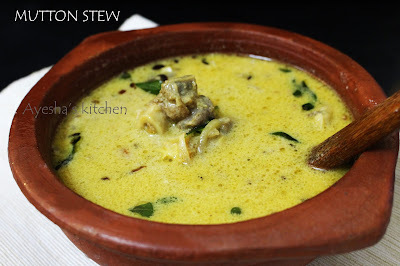 Here is the recipe showing how to make Kerala style mutton stew. Clean and cut the mutton into small pieces and drain the excess water in mutton well. Marinate the mutton with coriander powder, pepper powder, crushed ginger garlic ,fennel seed powder, curd and salt. Pressure cook it for 2 whistles without adding water. Set aside. Now heat oil in a pan and add green chilies to it. Saute onion till golden brown and then add chopped tomato. Cook for few minutes and add the cooked mutton and cubed potato. Mix well and add garam masala powder along with required salt. Let it cook for few minutes with closed lid until the mutton and potato is done.